Military Cemetery/Memorial / Fynwent milwrol: Wancourt British Cemetry, Pas de Calais. 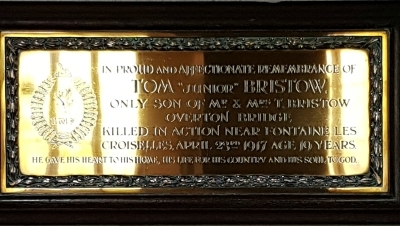 Tom Bristow was the only son of Thomas & Kate Bristow. He was born in the December quarter of 1897 (Ellesmere Vol 6a Page 640). Thomas & Kate Bristow, (nee Morris) had married in the June quarter of 1895 (Oswestry Vol 6a Page 1292). Tom was first recorded on a census in 1901. He was living at Overton Bridge, Flintshire. The head of the household was Thomas, 31 an Auctioneer who had been born in Whitchurch, Salop. His wife Kate, 38, had been born in St. Martins, Salop. Tom , age 4 and Kathleen his sister 6 had both had been born in Overton. Also in the household was Kate’s sister Ada S. Morris, 37 who like Kate had been born in St. Martin. There were 2 servants. The census of 1911 sees the family living at Gwallstill, Overton Bridge, Ruabon. They all spoke only English. Thomas Morris, then 51 was still an Auctioneer. His wife of 15 years, Kate, 38 had given birth to 2 children who were still living. Kathleen, 15 and Tom, 13 were at school. In the household was a boarder, Scott Wynne, 19 an Auctioneer’s apprentice and a Servant/Cook, Alice Chetwood. UK, Soldiers who Died in the Great War, 1914-1919 accessible on Ancestry, confirms all the military details at the top of this page. It adds that he enlisted in Stoke on Trent. The British Army WWI Medal Rolls Index Cards, 1914-1920 gives us us another Regimental Number of 11757 and tells us that he was awarded Victory & British War Medals . There is a Flintshire WW1 Index Card for Tom Bristow (Overton F2) in the Flintshire Record Office at Hawarden It confirms his regimental details above and tells us his period of service was 1 year. it was signed by his father Thos. Bristow on the 21st February 1920. Tom’s Army records are accessible on Ancestry.co.uk, and they tell us that he was exactly 18 years old when he enlisted in the 2/1 Montgomery Yeomanry. His Regimental number was 3585 which was crossed out and replaced with 55176. He was a Bank Clerk who lived in Stoke-on-Trent,. (The address is very hard to read, Ancestry transcribed it as Colwyn Loxcotham, Stoke On Trent). The form was signed on the 19th November 1915 at Stoke-on-Trent. The Certificate of Approving Officer was signed on the 13th May 1916 at Welshpool.
. The records include a form completed in 1919 and listing all of Tom’s living relatives. It was completed by his father, Thomas Bristow of Gwaylod House, Overton Bridge, Ruabon. Witnessed by Elliott Simpson, Clerk in Holy Orders, Overton Rectory. The form confirms that Tom’s only living relatives were his Mother, Father and sister Kathleen. Memorial Plaque to Tom in St Mary the Virgin Churchyard, Overton, Wrexham, Wales. The register of Soldiers’ Effects, in which the army calculated what moneys were owed to deceased soldiers includes an entry for Tom Bristow. It names his father as the Sole Legatee. He was paid £5 16s 3d on the 31st July1 1917 and his War Gratuity of £3 on the 19th November 1919. Tom Bristow left a will. Iin the England & Wales, National Probate Calendar (Index of Wills and Administrations) includes an entry for Tom Bristow of Gwaylod House, Overton Bridge, Denbighshire, Private No. 55176 of the second battalion of the Royal Welsh Fusiliers who died on the 23rd April 1917 in France. Administration was granted on the 10 July to Thomas Bristow, Auctioneer. Effects were £841 9s 10d. Thomas Bristow Senior died in 1921 and was buried in St. Mary’s Churchyard, Overton on the 20th February age 51 years, his address was Gwaylod House, Overton Bridge, almost 1 year after signing Tom’s Flintshire WW1 Index Card.